This slip-covered sofa offers a fresh take on casual and shabby chic style. High quality down blend cushions let you really sink into this deep two over two sofa. Slightly flared track arms and a clean tailored look keep this style light and modern. 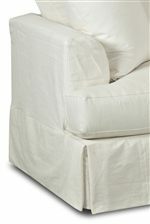 The Bentley Slipcover Stationary Sofa with Flared Track Arms by Klaussner at AHFA in the area. Product availability may vary. Contact us for the most current availability on this product. The Bentley collection is a great option if you are looking for Traditional Cottage Coastal furniture in the area. Browse other items in the Bentley collection from AHFA in the area.